Respondents who say that the effects of global warming have already begun, by party. Taken from the article in Environment: Science and Policy for Sustainable Development. Click on the figure for more figures and data from the article. 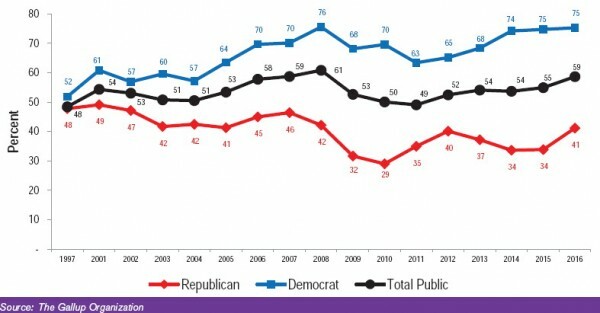 To trace the growing partisan divide in attitudes about global warming, Riley Dunlap, Aaron McCright, and Jerrod Yarosh use Gallup polling data from 1997 to 2016 to show how public opinion regarding the existence, causes, and solutions to a warming planet have diverged between Democrats and Republicans, particularly during the Obama administration. Splits between self-identified Republicans and Democrats in believing whether or not climate change is happening has consistently been much higher in the past eight years than between 1997-2002. In 2016, about three-quarters of Democrats agreed that global warming is occurring, compared to only one-quarter of Republicans. In the past decade, Democrats have become increasingly more likely to believe that warming has been caused by human actions. While Democrats have become more concerned about the impacts of climate change (56% in 2016), Republicans’ concern has remained the same (around 25%). In the past few years, about two-thirds of Republicans, compared to one-fifth of Democrats, felt that media coverage exaggerated global warming. This is a change from the relatively small partisan divide of 10 percentage points just twenty years ago.